#1. Aura dries extremely fast. It may look like you’ve missed sections as you look back at your work, but that “patchiness” is just a result of quick drying. Trust yourself. Don’t backroll, or you’ll risk pulling the sticky paint right back off in a mess. #2. Do the cut in brushwork first. Allow 15 minutes for sections to dry, then immediately follow up with paint on the walls. Don’t time your brush and roller work too close together or you’ll again pull the half-dry paint off the wall. #3. Grab the right roller. Use only microfiber or high density shed-resistant rollers and top quality polyester/nylon brushes to apply Aura. 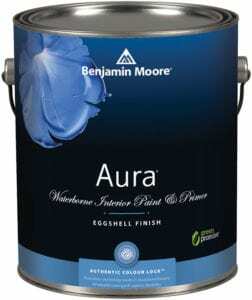 Once you get the hang of it, we think you’ll find a new favourite in Aura. Talk to our in-store paint experts to get started. Perry and his wife, Sherrie, are owners of Happy Valley Goose Bay Paint Shop. Stop by 167 Hamilton River Rd.